Note: Wood stove must be installed no closer to the wall than specified on the name plate, and in accordance with manufacturer’s instructions. Failure to do so can cause a fire. A permit and inspection from your town is required for installation of wood stoves and chimneys. The following parts are required for your installation Cathedral Ceiling or flat ceiling support, or adjustable roof support. This is the layout for a metal insulted chimney passing through a roof, using a roof support instead of a ceiling support. 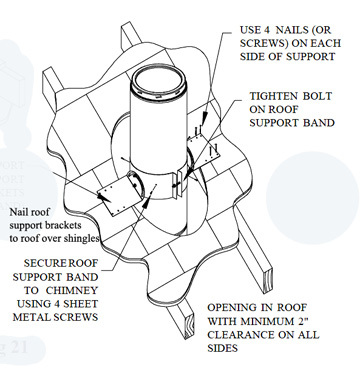 This method of securing the chimney is particularly suitable for cathedral ceilings. Each 3′ chimney section is screwed into the next, and secured with a locking band. Insulated metal chimneys must be no closer than 2″ to framing, roofing, or any other flamable material. When installing a chimney in a room with a flat ceiling and passing through an attic, you must use an attic insulation shield. In an enclosed space, such as rafters and joists, you must surround the insulated pipe with a rafter or joist radiation shield. 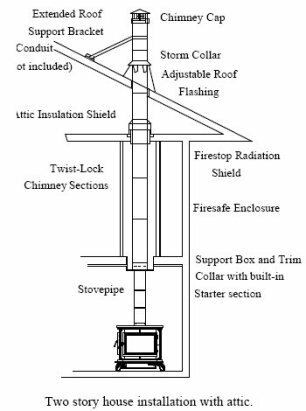 The Illustration below is for installing a rafter shield around a chimney that is supported with a roof support system as shown below.